On July 16th 1991, Sandy Bennett started to feel a sharp knife-stabbing pain and began to severely hemorrhage. “I called 911 and was rushed to the hospital. They couldn’t stop the labor. It was too late to stop it,” said Sandy Bennett, Ashley’s Mom. 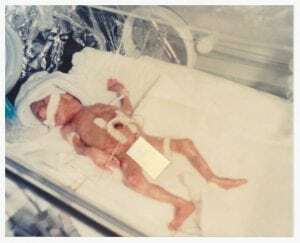 Ashley was born at 25 weeks and she only weighed 1lb 8 oz. Unfortunately, her lungs stuck together on the first exhale. “The doctors and nurses all looked at each other and immediately went to work to save her life. They fought for her life,” said Sandy. Ashley is now 27 years old, is living a happy life, loves eating burgers, and loves to watch Lethal Weapon!